BT Restaurant is jaw-dropping Joomla Template with responsive layout, stunning slideshow and vintage typography. 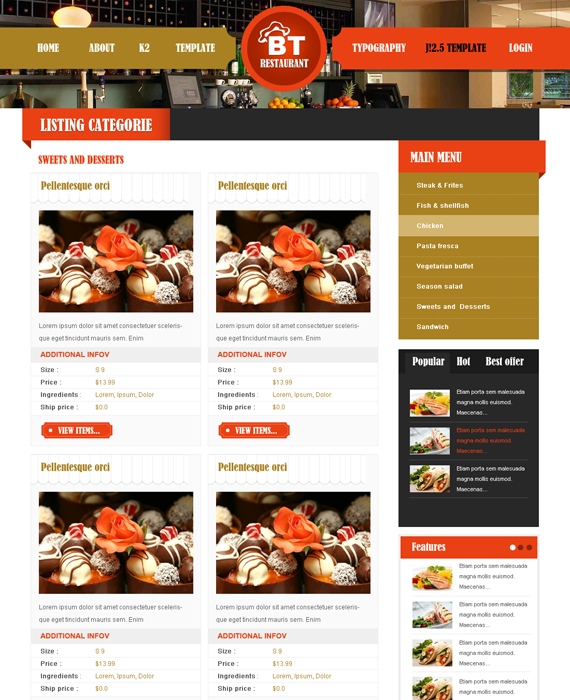 K2 component will help restaurant and coffee shop owner easily show their menus. With customers behaviors and needs on restaurants website research, we believe that BT Restaurant is the most appropriate solution for restaurant owners. BT Restaurant is fully responsive Joomla template and delivers the fascinating design on smartphones, tablets and desktops. The template came with 6 colors including orange (default), blue, green, pink, red and yellow.